Does the Book Chook blog look different? A wonderful friend, writer and illustrator, Kathleen Bullock has created my very own Book Chook header. I love to think those sweet chicks already love books and will soon be sharing them with other farmyard friends. Thank you, Kathleen! 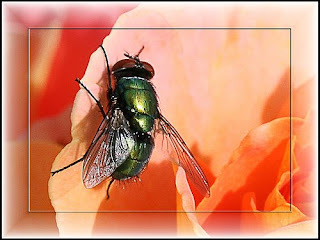 What's the deal with the picture of a blowfly? Tomorrow will see the start of a blog tour by talented and prolific Aussie writer and book reviewer, Sally Murphy. She will be here at the The Book Chook blog in a couple of days time, but why not catch her other appearances, and learn some trade secrets from a writer with almost 30 published books. Sally will be talking about her latest story, The Big Blowie, and answering Aussie bloggers' questions. There have been some great comments in my post about my dream for increased sharing of books with kids. Take a look at some readers' suggestions for ways we can truly make a difference.